Thank you to everyone for your thoughts for my sister. I spoke with her today and she is doing well. At this point, she has at least another week in the hospital. My guess is longer, but every day is another day the baby gets stronger! I am waking up earlier than I want to lately. I wish that I could at least sleep until the alarm goes off. I lay there now so I don't wake the illustrator up when I get up. He needs his sleep! I think I am in that weird state of being over tired...mentally and physically. I am hoping to get to bed a little earlier tonight...I am thinking we will watch the last episode of the first disk of "My So Called Life" and then we will be off to bed. We watched this when it was on TV and it is weird how I remember how I felt at that age. Now I am watching it from a different perspective since I have kids that aren't far from that age. That is scary! I am still that girl though. I swear I got chills last night when Jordan Catalano said Angela's name for the first time. Does anyone know what I am talking about? Now, for my latest obsession...waffle sandwiches! Seriously, I can't get enough of them. I have to restrain myself from boring you guys to death with the number of waffles I have been making. They are perfect for a breakfast sandwich though! Mine was a fried egg and Daiya melted between 2 waffle wedges. Jay went monte cristo style this morning. His had ham in it and a little bit of powder sugar on top. This was all his doing. I was pretty impressed with his thought process. I've warned you...I am on a waffle craze. It really makes the perfect sandwich! What is your latest obsession food or otherwise? What are your favorite old tv shows? Mine are "My So Called Life", "Felicity", "Mad About You"...I am sure I could go on, but these are shows that I love to rewatch. I'm so glad to hear your sister is doing well! She's in my prayers! 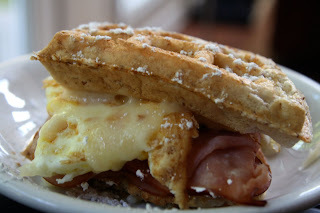 I want a monte cristo style waffle sandwich!! Actually, I've never had a monte cristo, but I know I'd love it!! Latest obsession: GA peaches and still on a panini kick! Ohhh, believe me - you will NEVER bore with your delicious waffle creations. 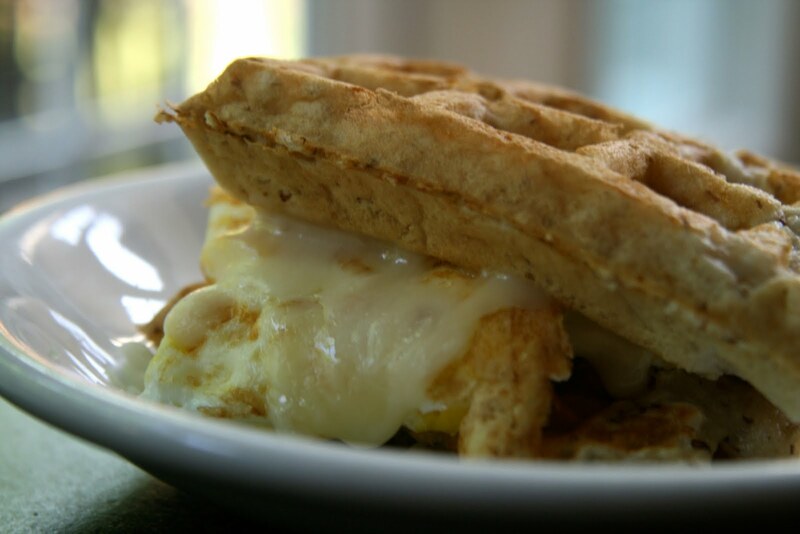 The wafflewich looks especially fantastic. My latest obsession is putting anything and everything in a wrap (or so it seems). I saw heab link your cornmeal delights this morning. Have been meaning all day to comment on your sisters post...love the people rather than food posts; always makes me feel so close to the blogger :) I hope sister and baby continue to do better. hugs! Waffles. They look great! Latest food obsession..kombucha baby! i remember "my so called life" was on when i was a frosh in college...i got to work with wilson cruz a few years ago and kept thinking, "that's ricky!!!" "felicity" was one of the best shows, ever. i need to rewatch it. I just read about your sister, I hope she's doing well! My sis is my best friend and I see her weekly but I'll move away soon and I will sure miss her a lot as well. I've had a waffle maker since SEPTEMBER but have never tried it! It's a shame I know.. though I have no idea what's holding me back! My fave old shows are My So Called Life, Felicity, and Swans Crossing. wow! what a delicious creation! Ugh, I've been waking up super early too, for no reason at all. Sometimes stress does that and you'd think the more tired you were, the more you'd actually sleep. Kind of the opposite. Sounds like you need a major pampering day! I loved Mad About You and Friends. I know there are others that I enjoyed, just can't think of them...Oh, Charmed and Providence. Ha-- STRANGE post for me-- Jordan Catalano was in my dream last night! What a weird coincidence. I love, love, love My So-Called Life and Felicity. I'm also a sucker for Dawson's Creek (I know, I know), and The Wonder Years was one of my favorites-- I am so eager for the day that they release it on DVD! I love Monte Cristos! Yum. I love to watch older shows: 90210 (original version), Full House, Saved by the Bell, Golden Girls, Cheers, anything! My So Called Life was one of my favorite shows! Jordan Catalano - talk about a blast from the past. I also loved Felicity! I am so glad your sister is doing well. CLEARLY YOU LOVE WAFFLES A LOT!! i cant even get over how skilled you are and how fluffy you made the waffle wich! !